While the rest of the US seems to be locked in the icy claws of winter, here in Colorado the days have been almost summery. My south-facing kitchen is bathed in brilliant sunlight throughout the day. At dinnertime it's cheerfully warm which brings on cravings for the cool salads and simple meals of summer. On one exceptionally warm evening last week I decided to make these cool and refreshing Thai sunflower noodles - something that hasn't graced our table since early last summer. Yes, I know that sunflower noodles are not traditionally Thai, but here's the story behind the recipe. 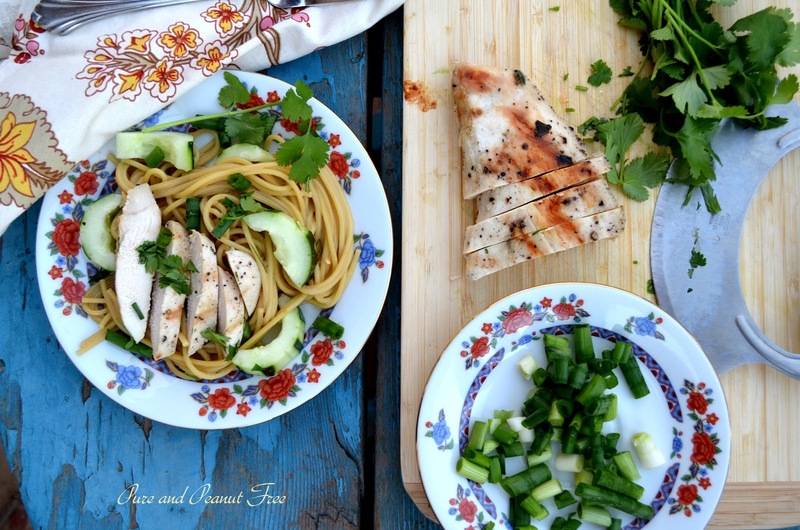 My husband's all-time favourite meal before going peanut free was Thai Peanut Noodles. It was a dish that was so easy to prepare and could be made almost entirely in advance that I came to rely on it on the busiest of days. When Eve was diagnosed with a severe allergy to peanuts, it's absence left a very distinct hole at dinnertime. With a few modifications to the original recipe, I came up with this to fill that hole, and honesty it's just about as perfect a substitute as you can get. You really can't tell that you're not eating peanut butter, the taste and texture are so strikingly similar. Now, I have to tell you that I'm very hesitant about feeding anything that remotely resembles peanut butter to my daughter, but when I do cook with sunbutter or soynut butter I instruct her to never eat anything like it outside the home unless I've confirmed that it's safe. She knows that peanuts are sly and elusive creatures, and hide in the most innocent of foods; she knows what peanut butter looks like, and why it's so risky. I don't try sugar-coat her allergy when we talk about reactions. She knows exactly what will happen if she eats peanuts, and I think she's on the right path to independently keeping herself safe, even at three years old. With that said, why should I let her allergies get in the way of exploring the vibrant flavours of Thailand, as long as I've prepared safe versions of the dish? This recipe comes together so quickly and easily, especially if you have a couple bags of Vietnamese marinated chicken stashed away in the freezer (as I always do). If you don't, just grill a couple of well seasoned chicken breasts well in advance so they're nice and cold at dinnertime. The noodles are best served at room temperature or chilled which makes this the perfect summertime meal. However, we like to have it any time of year. Especially in the middle of January, when mother nature is giving us a tantalizing taste of Spring before thrusting us violently back into the throes of winter. Cook the pasta according to the package directions. Be sure to reserve 1/3 cup of the pasta cooking water before draining. Drain and rinse the pasta under cool water. Place in the serving bowl and toss with the sesame oil. Set aside. While the noodles cook, prepare the sauce. Start with a clean, empty blender. Turn the blender on and carefully drop the garlic and ginger onto the blades. Process until finely chopped. Add the sunflower butter, soy sauce, sugar, vinegar, and red pepper flakes. Process until will blended. Pour in the hot pasta cooking water and process until smooth. Pour the sauce over the noodles. 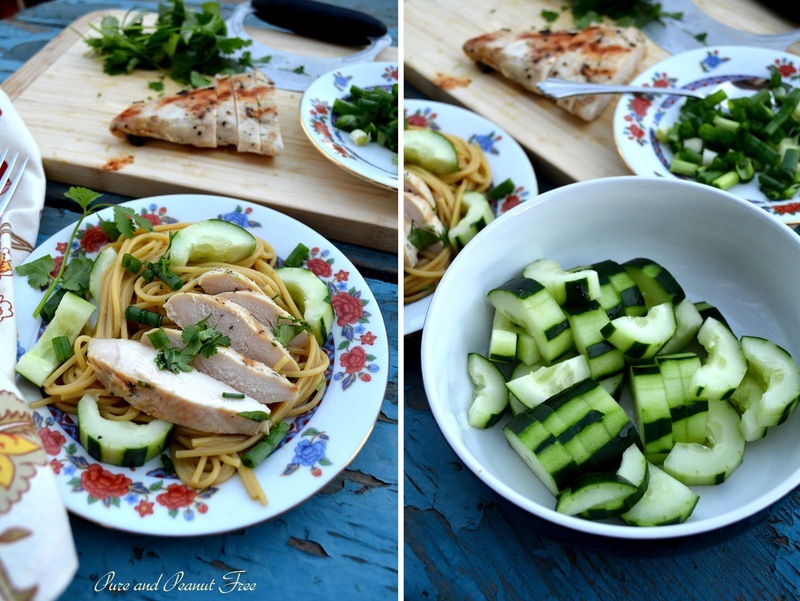 Slice the chicken and add to the noodles. Add the cucumbers and scallions and toss until everything is well coated with the sauce. Top with the chopped cilantro. Serve at room temperature or chilled. For more allergy friendly recipes check out Allergy Free Wednesdays. yum! All my favorite flavors!! Can't wait to try it! Featuring your recipe this week on AFW! Thank you so much! I look forward to seeing it!